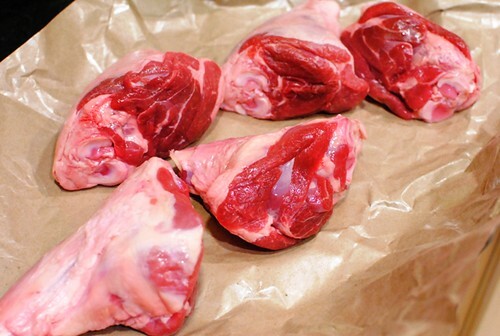 I was recently inspired to braise some lamb shanks on a recent trip to my local Whole Foods. 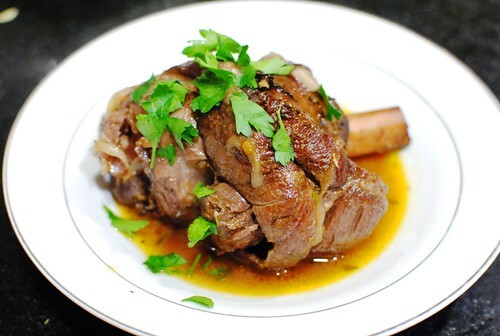 They had a spread of some pretty nice looking lamb shanks, and at $6.99/lb, I thought they were reasonably priced. I’d be able to braise a whole bunch and even bring some for lunch to work during the week. Heat oven to 350 degrees. Pat shanks dry and season with salt and pepper. Heat oil in a large Dutch oven over medium-high heat until just smoking. Brown half of the shanks, reducing the heat if the fat begins to smoke, about 10 minutes. Transfer the shanks to a large plate and set aside. Repeat with the remaining shanks. Pour off all but 2 tablespoons of the fat left in the pot and return to medium-high heat until shimmering. Add the onions, carrots, celery, garlic, tomato paste, herbs and 1/4 teaspoon salt. Cook until vegetables soften, about 5 minutes. Stir in the broth and wine, scraping up any browned bits. Add the shanks. Bring to a simmer, cover, and cook in the oven for 1 1/2 hours. 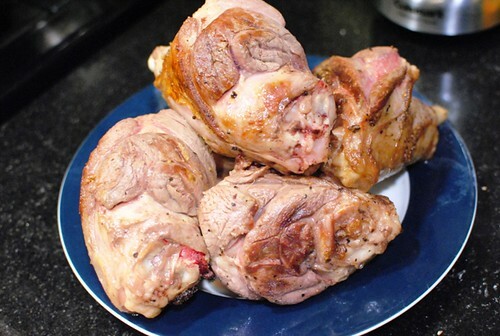 Uncover and continue braising until shanks are browned and the meat is falling off the bone, 45 to 60 minutes, flipping the shanks over halfway through the cooking time. Remove pot from oven and let shanks rest in the sauce for 15 minutes. Transfer the shanks to individual plates and portion the vegetables around each shank. Spoon off any fat from the cooking liquid, then season with salt and pepper to taste. Spoon some of the cooking liquid over each shank before serving. I followed this recipe pretty closely, using a Côtes du Rhône as the wine of choice. I was pretty happy with how the lamb turned out. It was really tender; truly fall-off-the-bone. I found the meat to be rather gamey though, and I’m not sure if that was a result of my cooking skills (or lack thereof) or the lamb itself. I’d definitely make this again though. It was relatively easy to make, comforting and pretty damn tasty.